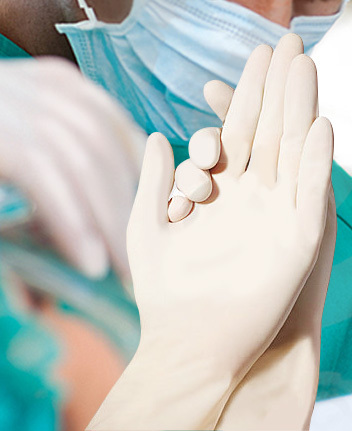 PRIMUS manufactures Sterile Latex Surgical Gloves for use in Surgeons Operating Room / Environments. Surgical gloves have more precise sizing (from size 5.5 to size 9) and are of higher specifications. These gloves are anatomic in shape and fits perfectly to the surgeon’s hand enabling him to get a better grip and functionality while performing surgery. Primus Manufactures both Powdered Surgeons Gloves and Powder FREE Surgeons gloves. Powder Free Surgeons Gloves are basically used by surgeons who are prone to protein allergy by latex. Primus also manufactures Powder FREE Surgeons Gloves which are Polymer Coated which helps for easy donning of the glove by the surgeons. The Surgeons Gloves are basically beaded in nature, but some European countries demand Non Beaded Gloves also. These types of Gloves are also manufactured by Primus on the basis of minimum order quantity. The Surgical Gloves are sterilized either by EO (Ethylene Oxide Gas) or Gamma Radiation as per customer requirement. Packaging of the gloves is based on specifications provided by the customer. Consistently low protein levels of 50 µg/dm2 or less. Good elongation and full anatomic shape provide little hand fatigue and lasting comfort in use even during long procedures. Micro rough surface for that extra grip. In 13 x 27 cms Peel Down to Open Pouches. In 15 x 30 cms Peel Down to Open Pouches.